Type Locality Cape Lopez, Gabon. Etymology The generic name comes from the Latin prefix par-, meaning equal and Ailia, a genus of schilbeid catfishes, in reference to the similarity between this genus and Ailia. 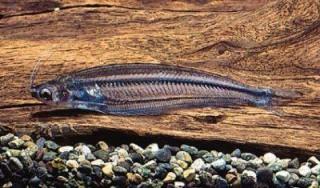 Identification All species of this genus have no dorsal fin and are small being no larger than 150 mm SL. Distribution Africa: Ogowe, Congo, Quanza, Luculla, Chiloango.